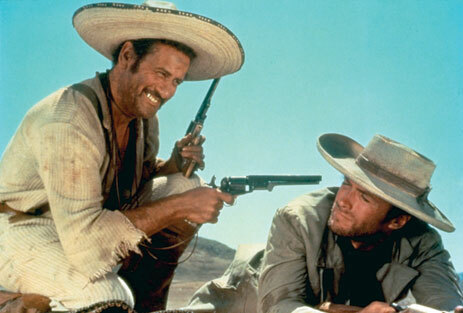 Continuing with its celebration of the nonagenarian spirit, the TCM Classic Film Festival paid tribute to 94-year-old Eli Wallach with a morning screening of Sergio Leone's The Good, The Bad and the Ugly (Il buono, il brutto, il cattivo) (1966) at Grauman's Chinese Theater. 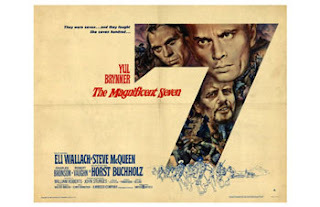 As the TCM program notes synopsize: "Often hailed as the greatest of all 'spaghetti Westerns,' this 1966 epic has become an indelible part of our culture. 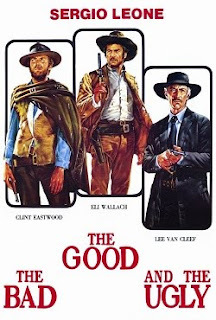 The title The Good, The Bad and the Ugly is now a part of the vocabulary, while Ennio Morricone's influential score created new ways of setting Westerns to music. Director Sergio Leone expanded writer Luciano Vincenzoni's idea for a film about three scoundrels looking for treasure during the Civil War to deal on a grand scale with the absurdity of war. For history buff Leone, that meant making the film as accurate as possible, from the Confederate uniforms to the design of the Betterville Prison Camp (modeled on Andersonville). He also planned it as the third film of his Dollars trilogy, following A Fistful of Dollars (1964) and For a Few Dollars More (1965), which meant getting Clint Eastwood back to star as the good. 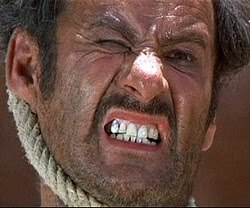 For the bad and ugly sides of the equation he jumpstarted Lee Van Cleef's career and gave Eli Wallach the role of a lifetime. The production in Spain was lavish and so chaotic Wallach and Eastwood were almost killed (Wallach more than once). But it also provided the epic canvas for Leone's vision of war, greed and personal demons." The "role of a lifetime" was, of course, that of the scheming, scene-stealing Tuco. Eli Wallach and Robert Osborne introduced The Good, The Bad and the Ugly with an onstage conversation. Robert Osborne: Tell us a little bit of how you first got involved with this? 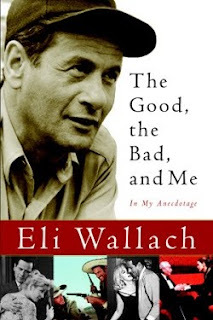 Eli Wallach: The Good, the Bad and the Ugly? Wallach: Well, I didn't know I was going to wind up as The Ugly! I was in California doing a film and Sergio Leone came and said he wanted to meet me. I said, "All right. What for?" He said, "It's for what they call a 'spaghetti Western'." I asked him, "What is a 'spaghetti Western'?" I had no idea what the hell a "spaghetti Western" was; but, he showed me the credit at the beginning of his movie. He comes across and then a gun comes in and shoots him right off the screen and I thought, "Anybody who can do that, I'll work for him." Osborne: What was that experience like? Wallach: I'll tell one little quick story. Osborne: You tell as many stories as you want. Wallach: He said, "I don't want you to put a gun in your holster." I said, "Where do I put it?" He said, "Look, you have a rope around your neck and in your hand is a gun and when I say, 'Action! ', you go like this [Wallach makes a whooshing sound]. I said, "Will you show me?" He said, "Don't put the gun in the holster. Don't." He put the rope around his neck, he had the gun, and he went like this and the gun missed his hand and hit him in the groin. He said to me, "All right, Eli, just put it in your pocket." For the rest of the movie I never had a holster. I kept my gun in my pocket. Osborne: Problem solved! Was that a good experience over there in Spain? Did you love traveling to Spain and working over there? Wallach: Spain and Italy. Yeah, I enjoyed it. Spain is a beautiful country, beautiful, and it was a joy to work there. Osborne: And how about Clint Eastwood? Wallach: Clint? He said to me, "Don't show off. This is my third Italian movie and I know it's very dangerous. Don't put events. Don't be showing off." I said, "What do I do?" He said, "Act." And so that's what I did. Osborne: And you did it very well. Osborne: Your first role was in Baby Doll in 1956. Why did it take so long to get you to do a movie? And I've always wanted to ask: there's always been the story that you were the first one offered the role of Maggio in From Here to Eternity, which you turned down supposedly to do Camino Real on Broadway? Is that true? Osborne: Did you ever regret that? Wallach: No, because I chose to do what I did. I was in the Army for five years in World War II. I wound up as a captain in the medical administrative corps. I was in Berlin in 1945 two months after Hitler committed suicide and then they were going to ship me to Japan; but, then the bomb went off and I went home, after five years. Work is what intrigued me. As a matter of fact, in the hospital we put together plays and I always wound up as Hitler. It was very interesting. Osborne: So movies didn't intrigue you that much then? Wallach: No. For the first five years after I came out of the Army, I spent with my wife [Anne Jackson] on the stage doing the plays of Tennessee Williams. For 10 years I didn't do any movies. I wasn't involved with movies. The stage was what attracted me and what I needed to do. 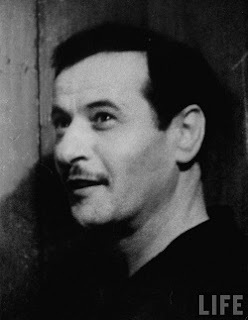 Then I got a job with Elia Kazan directing the play then the movie Baby Doll by Tennessee Williams. That was my first film. Osborne: How did you like film acting once you started getting into it? Wallach: Oh, I loved it. Wallach: Yeah. I made a movie here not long ago with a lady named Kate Winslett called The Holiday. Osborne: You've never stopped working. You have two films coming out this year. You had two last year. Two the year before. Wallach: I never stop. When I die, I'll stop. Though at my age I always say, "How old am I?" Osborne: I don't know. I would have to look that up on IMDb. Wallach: I'm 94 years old. Wallach: You mentioned From Here to Eternity. 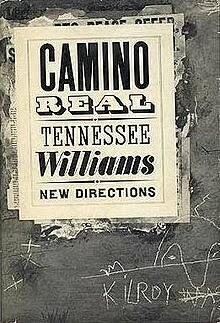 I was set to do a play by Tennessee Williams called Camino Real and they didn't have the money so I auditioned for the movie called From Here to Eternity. The producer said, "He doesn't look Italian enough." So I said, "I've been playing an Italian by Tennessee Williams for a year and a half. What do you mean I can't?!" He said, "You'll have to do an audition." I said, "All right." I did the audition and I got the job for From Here to Eternity. And then the money came through for the play. Now I had to choose. The play? Or the movie? And I chose the play. You know who played the role of Maggio in the movie? Frank Sinatra. Every time he'd see me, he'd say, 'Hello, you crazy actor!' " But we were good friends. 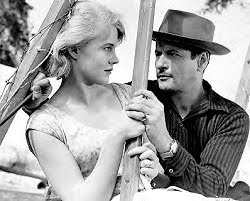 Osborne: You also made the famous The Misfits for John Huston with that incredible cast, you being one of them: Clark Gable, Marilyn Monroe, Montgomery Clift, Thelma Ritter. Incredible people. Tell us a little bit about that experience. Wallach: I knew Marilyn. She had come to New York in a scubble with the movies here. She came, we met, and we learned about a relationship and she got the part in this movie that her husband Arthur Miller was going to put on. I was going to be under the type "A Marilyn Monroe movie", then Clark Gable came in so I moved over one. Then came Montgomery Clift and I moved over two. And then came Thelma Ritter. She said, "I'll do it but I have to be first under the title." I wound up on Third Avenue somewhere! I learned my lesson because they were a wonderful team of actors and John Huston was marvelous. The first day I worked with Clark Gable, I was sitting in my truck and he was standing and leaning. John Huston said, "Action!" and I kept looking at Gable and I was thinking, "He's the King of the Movies! I hope he doesn't know I never saw Gone With the Wind." He looked at me and he went [Wallach imitated Gable garbling his words] and he couldn't remember what the hell I did or where I was from: Brooklyn. Right? So Huston said, "I said action!" Then he said, "Forget it" and he ordered a drink for each one of us. And we hooked together. From then on we were a great couple. Osborne: What about Huston as a director compared with the other directors that you've worked with? 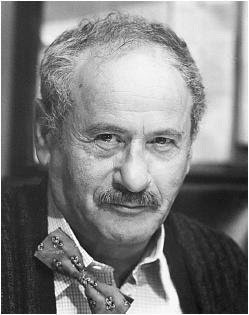 Wallach: He was the best. 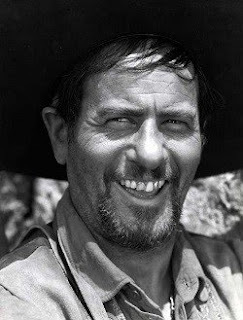 He was doing The Treasure of the Sierra Madre and his father Walter Huston was playing one of the big roles. I loved that John Huston said to his father, "Listen, you're going to be in this movie and I want you to take out your teeth." His father was a huge star on Broadway, right? But he took out his teeth. I wasn't going to take out mine. Osborne: You say Huston was the best. What made him the best? Compared to the others? Wallach: He didn't say, "You have to do it this way or that way or move this way. Impress me." And I worked to play that movie for a reason in dealing with the people in the movie, not with the director. But he was very helpful. Wonderful. Osborne: Was Elia Kazan as a director on film different than when he directed you on stage? Wallach: I wouldn't say that. But he did say a very interesting thing. He said, "In the movies, all the crew people who are making the movie, when they're ready they say to the director, 'We're ready' and then the director usually says, 'Action!' " Kazan said to me, "Listen. Let them take all the time they want to achieve what they want—the set, the scenery, and all of that—because when you're playing your scene where they burn down the cotton gin, you turn your back to the audience and take your time, the same amount of time they took, and when you're ready just signal with your hand and I'll say, 'Go ahead.' " That was the way he directed. He directed me and I played it and he didn't have to say, "This way or that way. Never." I loved working with him. 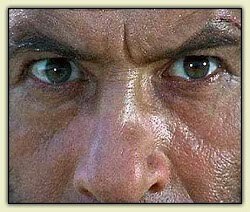 When I did my first movie with Clint Eastwood, Mystic River, he said to me, "I'm doing a movie up in Boston and I'd like you to be in it." I said, "All right. How many weeks?" He said, "One day." I said, "One day?!" He said, "Oh, c'mon, it will be a reunion." So I went for that one day and it was a great experience because—the way he directed me?—he said, "How are you, Eli?" I said, "Good." He said, "You ready?" I said, "Yeah." He said, "So do it." Osborne: Any directors you wouldn't want to work with again? We won't tell them. Wallach: I always made peace with the people I've worked with. I listened to what they had to say. But then I would adjust to what my needs were. And they were helpful to me. I've worked with some great directors. Osborne: Who are some of the other favorites you've worked with? Wallach: John Sturges on The Magnificent Seven. Osborne: Not a bad movie. Wallach: [Coyly] You're a treat. Osborne: You're a treat! My God. You're terrific, just terrific. I love your stories, we love your work, you've done such great work and we so appreciate you and appreciate your taking the time to come and join us and making this film festival so important. Wallach: And I have a sharp thank you to Turner Classic Movies for a reason: they put the movie on! You don't have to sit through 18 commercials. Osborne: I often think it's so unfair. I don't know why—when movies first went on television, back in the days when television needed movies terribly—why they didn't make a rule back then that they could only show a movie uncut. You could put commercials on before or after but not during the movie. But they let that get away from them and I think it's such a serious damage done to movies because of the rhythm of a movie. I'm very proud of that about TCM. Wallach: Well, I'm glad you asked me to be here. Osborne: We're thrilled to have you here and, again, we love your lovely wife Anne Jackson, and we love you, thank you. 05/11/10 UPDATE: "[S]o much of what we remember vividly from Il Buono, Il Brutto, Il Cattivo (The Good, The Bad and the Ugly) can be traced to the words which laid the foundation for the imagery with which Leone and his stars fashioned this memorable movie," writes Dennis Cozzallio at Sergio Leone and the Infield Fly Rule, as preface to his obit tribute to screenwriter Furio Scarpelli.